YONGIN, South Korea, April 16, 2019 /PRNewswire/ — GC Pharma (formerly known as Green Cross Corporation), a South Korean biopharmaceutical company, joins World Hemophilia Day, observed annually by the World Federation of Hemophilia (WFH) and the global hemophilia community to raise awareness of the disease and other bleeding disorders. This year’s slogan is "Reaching out: The First Step to Care". With this slogan, the global bleeding disorder’s community focuses on the the importance of improving interest and awareness of hemophilia. 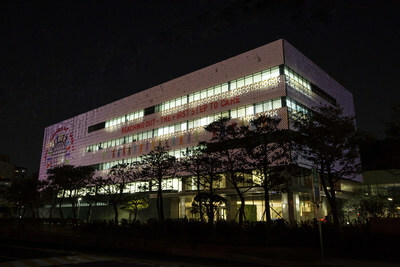 GC Pharma features this year’s slogan image on giant exterior facade of its main campus in Yongin, South Korea. As part of GC Pharma’s continued support of the hemophilia community, the company features this year’s slogan image on its global website and giant exterior façade of its main campus in Yongin, South Korea.